This is a little gift box that I made for a friend's birthday, it is a template from Lauren Meader that I purchased a while back. It is pretty easy to make, two pieces for the box and two pieces for the pockets. Then you decorate with pieces of designer paper and an image and decorations for the front and you're done! Which why does it take all day to make then, LOL?! I used Stampin' Up for almost all of this for once. The designer paper and card stock, and the felt flower on the front, the ribbon and the stamp are all SU. 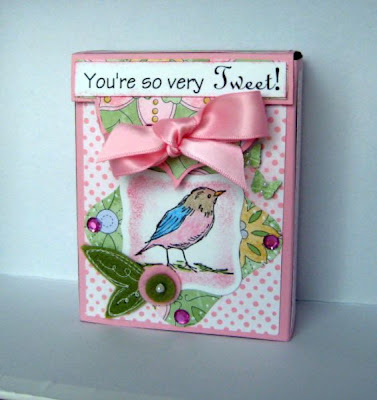 I love this little bird and the sentiment is one I printed from my computer as I don't have this stamp. I love pink and green together and thoroughly enjoyed making this. Thanks for stopping by, I hope you like my little project! That is way cute! 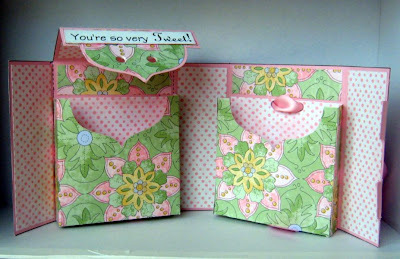 Love the box pattern and how you papered the whole thing! Dang though, she Lauren Meader, charges $5 for a template! Good for her, but a little expensive for me! Beautiful gift. Great work ! I get to see this in person and it is so cool and special! I love it, Lori! I soo appreciate the time and effort you put into this. Thank you, again! Lori, I loved your card! It's a great job. And this template for Lauren Meader is fabulous. Great gift for someone,I love your colors.